This document describes the purpose and functionality of Per VLAN Spanning Tree (PVST) simulation on Multiple Spanning Tree (MST) switches. It also addresses the basic rules that must be followed in order to avoid PVST simuation inconsistencies and the reason for these inconsistencies. Cisco recommends that you have basic knowledge of MST concepts, such as Common and Internal Spanning Tree (CIST) and boundary ports. 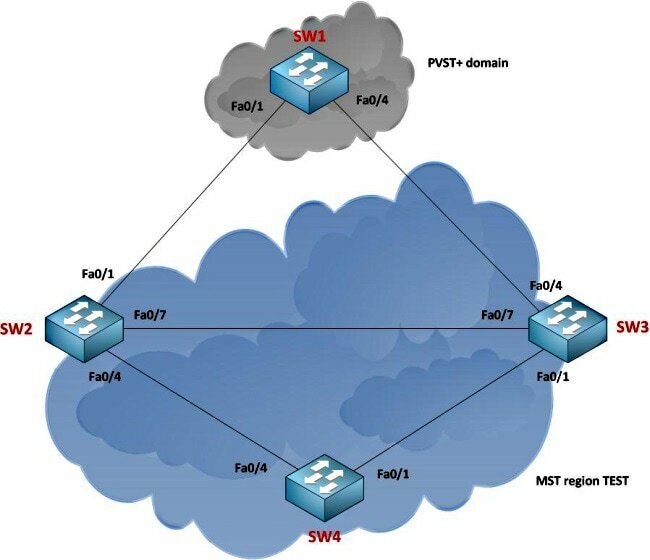 Often, MST regions are connected to other domains - Per VLAN Spanning Tree Plus (PVST+) or rapid-PVST+ regions. These switches that run PVST+ (or rapid) cannot process MST-type Bridge Protocol Data Units (BPDUs). For this reason, there must be a backward-compatibility mechanism that runs so that these two domains can interact with each other seamlessly. This is what PVST simulation addresses and achieves. This simulation must be run only on boundary ports - these are ports that are directly connected to the PVST+ domain switches. The receipt of a Shared Spanning Tree Protocol (SSTP) BPDU on the port of a switch that runs MST causes the PVST simulation mechanism to trigger. In this topology, Switch 1 (SW1) runs PVST+, while switches SW2, SW3, and SW4 run MST and are all in the same region. If the root bridge for CIST is within a non-MST region, the spanning-tree priority of VLANs 2 and above within that domain must be better (lesser) than that of VLAN 1. If the root bridge for CIST is within a MST region, VLANs 2 and above defined in the non-MST domains must have their spanning-tree priorities worse (greater) than that of the CIST root. If you do not adhere to these two rules, you encounter the PVST simulation failure. These two rules, in a way, are identical to the root-guard feature and are actually derived from it. The next sections examine the rules (scenarios) individually in order explain how PVST simulation works. SW1 does not hear any BPDUs that it can understand, so it elects itself as the root for all VLANs, and starts to send BPDUs toward the MST-region switches. When SW2 receives a SSTP BPDU on Fa0/1, it understands that the interface is connected to a PVST+ domain. It subsequently sets the flag in order to enable PVST simulation on this interface. A critical concept to understand is that only the Institute of Electrical and Electronics Engineers (IEEE) BPDU for VLAN 1 is processed for the root bridge election. This is compared to only the instance 0 information from the MST region. No other instance information is used in order to elect the root bridge for CIST. No other VLAN information from the PVST+ domain other than VLAN 1 is used in order to elect the CIST root bridge. SW1 generates one BPDU for every VLAN, and sends them to SW2. These BPDUs are simply used for consistency checks as part of the PVST simulation. However, their information is not copied anywhere. When these BPDUs arrive on SW2, the VLAN 1 BPDU is processed, which is reflected in the outputs. The other BPDUs then go through the PVST simulations root-guard-based consistency check. In this setup, the consistency check passes and there is no PVST simulation failure. In order to generate a failure, increase the priority of VLAN 2 to greater than 8192 on SW1. Port path cost 200000, Port priority 128, Port Identifier 128.3. The information that comes from SW1 is 12290:0022.0dba.9d00, and this is compared to 8193.0022.0dba.9d00. Since the port is a root port, and it has received an inferior BPDU, it enters into a PVST simulation failure state and displays the error message seen previously. This is because the boundary port cannot be in two different states at once - the receipt of the inferior BPDU dictates that the port should move to designated, whereas via VLAN 1 information dictates that the port should remain a root port. This confusion is prevented with PVST simulation. The port is also moved to a PVST simulation inconsistent state. This situation reverses the roles from the previous scenario. The root bridge for the CIST is now in the MST region. SW2 is the root bridge. Fa0/1 is still the boundary port, and the PVST simulation runs on this interface. This now plays a very important role again. The PVST+ domain expects one BPDU per VLAN, but MST does not do that. PVST simulation takes the bridge information of instance 0 (priority + MAC address), and it creates one BPDU for every VLAN that is allowed across its interface with this information. It simply tags each of these BPDUs with the appropriate VLAN IDs. In order to generate a failure condition for this, change the priority for VLAN 2 on SW1 to a value lower than 12,288. The information that comes from SW1 is 8192:0022.0dba.9d00, and this is compared to 12288:0022.916d.5380. Since the port is a designated port, and it received a superior BPDU, it enters into a PVST simulation failure state and displays the previous error message. The port is also moved into a PVST simulation inconsistent state. If the MST region has the root bridge for CIST, PVST simulation is required in order to replicate instance 0 information, and create one BPDU for every VLAN that is allowed across the trunk and tag it with the appropriate VLAN information. If the root bridge for CIST is outside of the MST region, then PVST simulation is required to process VLAN 1 information only. The other BPDUs (VLANs 2 and above) are used for consistency checks and information from these VLANs is never copied as root bridge information. If these conditions are not met, the boundary port is put into a PVST simulation inconsistent state until the problem is corrected.